Fitting Tape is a cloth tape specifically designed to modify release, ease grip tension and/or adjust hole size without making major changes to ball drilling. If you suffer from increased swelling while you bowl, Fitting Tape could be an ideal solution. No more fidgeting with taking pieces of tape in and out of your ball. Simply apply the tape to your fingers or thumb prior to bowling and remove as you swell. F225 Fitting Tape Beige; smooth texture, tight weave. The 200 series is our most popular and most common style of Fitting Tape. Each roll is 1" wide, approximately 14' in length and will yield 40-50 applications depending on use. should have tape on sale once in a while. Average increased from low 180's to near 200. Put it on before practice and stop fiddling with tape all night. Gives a great thumb feel. Turbo's colored tapes (green, purple, and beige) are very effective for getting that snug thumb fit. Each piece stays in place and will last an entire series if you need it. I use the tapes solely for fitting, but the tapes would provide good protection as well. Hi! You can wrap either or, whatever is most comfortable for you. You can wrap it however is most comfortable to you. 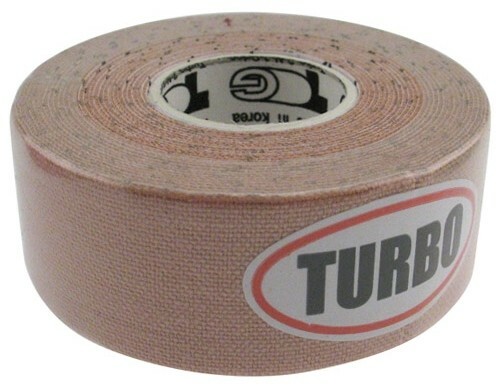 Due to the time it takes to produce the Turbo 2-N-1 Grips Fitting Tape Beige Roll ball it will ship in immediately. We cannot ship this ball outside the United States.